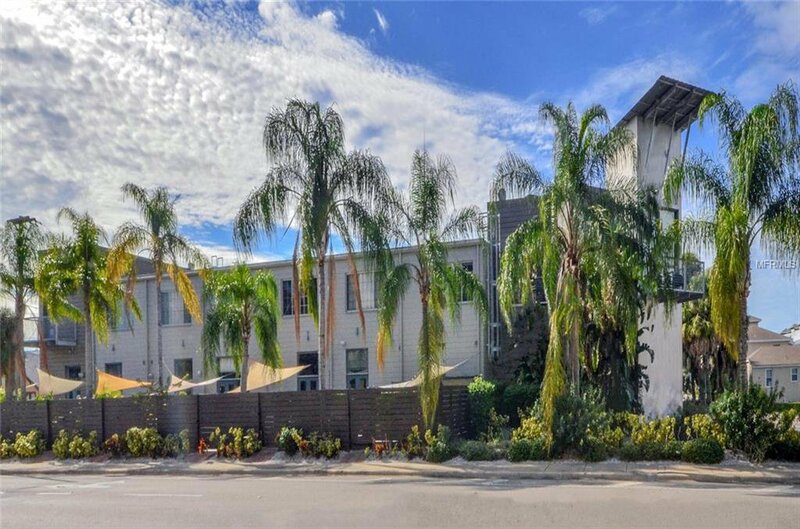 SoHo Lofts is true urban living at its best with a superb location in South Tampa’s Soho District! This spacious and well-lit townhome has an industrial architectural open floorplan that includes: 14’ ceilings, polished concrete floors, exposed concrete block walls, ceiling beams, conduits, and air ducts. Other features include contemporary track lighting and an open steel staircase. The kitchen features streamlined cabinetry with frosted glass doors, stone countertops, farmers sink, tile backsplash, stainless steel appliances, wine fridge, cooking island with pendant lighting, and cabinet style pantry system around the fridge. Dual glass doors lead to a large open patio with palm trees, bamboo, triangle awning, with plenty of room to entertain and grill. The master suite has a wall-to-wall closet with glass doors. The master bath has dual glass bowl sinks and a large shower with river rock floor. The second bedroom has been modified to accommodate two kids and area can be converted back to original larger footprint if desired. Other features include: laundry closet system with stackable washer/dryer; jetted tub in second bath; large storage area (currently used as a bunk); 2015 A/C; exterior paint and fencing redone around 2016. Right cross from Greenwise Publix and walking distance to your favorite restaurants, shops, nightlife spots, and Hyde Park Village! Listing courtesy of KELLER WILLIAMS SOUTH TAMPA. Selling Office: LOMBARDO TEAM REAL ESTATE LLC.